Male or female, young or old, thinning hair can be devastating. Instead of trying every shampoo for thinning hair out there, turn to Ultrax. Ultrax Labs provides a range of products, including Ultrax Labs Hair Surge, that has been proven to stimulate hair growth. They’re all designed for thinning hair and are safe for all skin and hair types. The great results are based on years of proven clinical studies. If you’re ready to increase your hair growth and decrease premature hair loss, then keep reading to discover Ultrax products, including Ultrax Labs Hair Surge, the perfect shampoo for thinning hair, and Ultrax Labs Hair Lush, the ideal leave-in treatment. 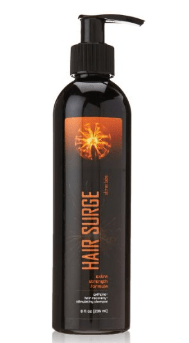 Ultrax Labs Hair Surge Shampoo is made with caffeinated compounds and essential oils that provide results no other hair regrowth shampoo can compete with. The caffeine helps to extend the natural life cycle of hair follicles, preventing premature hair loss and creating a thicker head of hair. It also includes ketoconazole, which is a powerful anti-inflammatory and anti-fungal ingredient. Dandruff is often caused by infections, which in turn can damage hair follicles. Ketoconazole can help to create a healthy environment that encourages long-term hair growth. Within a month of using Hair Surge shampoo, I really noticed the results I was promised. My hair is thicker and stronger than ever before and also looks heathier than it ever has, thanks to this amazing hair regrowth shampoo. Even though the results are extraordinary, Ultrax Labs Hair Surge Shampoo is incredibly easy to use. Just massage and lather shampoo into scalp and allow to sit for 2-5 minutes. Rinse well with warm water. For best results, use the shampoo five times a week. Ultrax also provides a fabulous conditioner that not only moisturizes hair but also helps with the fight against hair loss. It also includes stimulating caffeine as a main ingredient, which is key in the Ultrax product line. In addition, it includes eucalyptus, which has been shown in studies to strengthen the root of the hair. Another effective ingredient is chamomile recutitta, which can help to alleviate inflammation that could be hindering hair growth. I love the way my hair smells after using this product. The eucalyptus is so calming. I feel like I’ve just left the spa every time I use this conditioner. For best results, use Ultrax Labs Hair Solace Conditioner after Ultrax Labs Hair Surge Shampoo. Run a small amount of conditioner through hair, allow it to sit for 2-5 minutes before rinsing out with warm water. Use every time you use Ultrax Labs Hair Surge Shampoo, which should be five times a week. What really sets Ultrax Labs apart from the competition is that they offer additional hair growing products besides just shampoo and conditioner. Their Hair Lush Thickening Treatment was designed to increase the physical thickness of each strand of hair. This leave in treatment can help to instantly improve the appearance of hair while minimizing hair loss. I love the tingling feeling that this product creates on the scalp, not to mention how soft my hair feels afterwards. Try using this product after months of harsh weather or whenever you need an extra boost for your hair health. It won’t make your hair feel heavy or greasy, as long as you remember that a little goes a long way. Ultrax Labs Hair Lush can be used on dry or wet hair. It is recommended to use after Ultrax Labs shampoo and conditioner. Apply a small amount and massage directly into scalp. Run fingers through hair as well for added benefits. Sometimes the best way to tackle thinning hair is from the inside out, which is just what Ultrax Labs Hair Maxx does. It consists of over 20 essential vitamins, minerals and herbs. This includes pumpkin seed powder, which has been shown to help promote healthier and faster hair growth overall and nettle leaf powder, which is a natural DHT blocker (believed to be a major cause for both male and female hair loss). I took this supplement for 3 months, which is the recommended minimum. I noticed results much faster and just overall felt healthier and more alive. 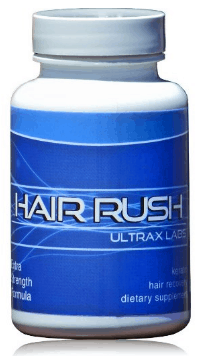 For this reason, I know Ultrax Labs Hair Rush DHT Blocking Hair Loss Maxx made a huge difference in the health of my hair. Ultrax Labs recommends taking two pills each morning. It doesn’t get much easier than that. Keep them next to the coffee machine or anywhere else where you’ll be sure to see them each morning. Are Ultrax Labs Hair Products Suitable for Both Men and Women? growth products. Ultrax Labs products work for both men and women, which is just one of the many benefits that come along with choosing Ultrax Labs. This is thanks to the high-quality ingredients used in the products, along with the years of clinical studies that back up the results and have fine-tuned each product. There’s no need to suffer from thinning hair if you don’t want to. When I noticed that my hair was starting to thin, thanks to less than ideal weather, stress and damage from over styling, I thought there was nothing I could do. Luckily, I came across Ultrax Labs, including their shampoo for thinning hair, conditioner and other products. I know that their products saved my hair and gave me back the confidence I was missing. My Ultrax Labs review is just one of many that proves how beneficial it is. If you’re worried about the state of your hair, give Ultrax Labs products a try. I can assure you that you’ll be glad you did.